Supercritical fluid extraction (SFE) was compared with hydrodistillation extraction (HD), Soxhlet extraction (SE) and microwave assistant extraction (MAE) for an analysis of volatile components of Gastrodia elata Blume. 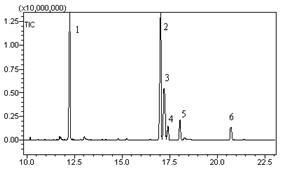 The identification and quantitation were conducted on gas chromatography-mass spectrometry (GC-MS). Results showed that SFE turned out to be the preferred among th e four methods in terms of extraction yield and the composition. The effects of variables, including pressure, temperature, extraction time and modifier volume, on SFE yield were investigated. Free fatty acids (FFAs) turned out to be predominant in the volatile fraction by SFE, and the top 5 abundant FFAs were quantified. Palmitic acid was found to be the most abundant (13.0 ± 0.5 mg/g) in the extract by SFE, followed by linoleic acid (10.4 ± 0.4 mg/g) and linolenic acid (2.6 ± 0.1 mg/g).